BMW’s foray into the world of front-wheel drive manages to be both stylish and practical in equal measure. One-touch folding rear seats and an electric tailgate ensure its user friendly, there’s 1510 litres of maximum space available, and the rear seats slide by 150mm for added versatility. It’s also nice to drive and the cabin is comfortable, spacious, and boasts impressive solidity and material quality. 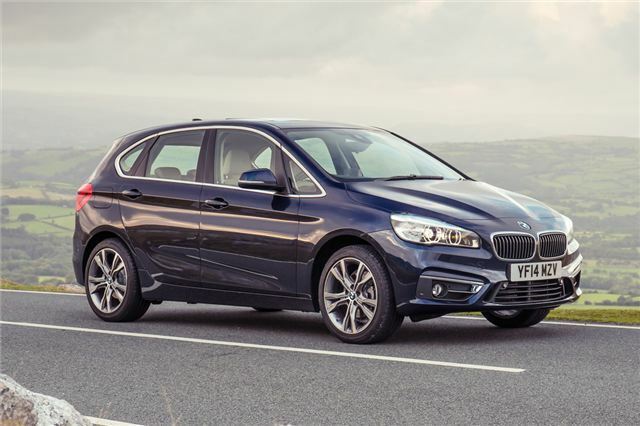 Slotting into band C is the petrol-powered 218i that gets BMW’s refined and frugal 1.5-litre three-cylinder engine, and it’s a mighty impressive unit. Smooth, punchy, and characterful it makes a very strong case for sticking with the green pump at the forecourt. This web site is painfully slow, could you not just give us the option to vies the cars as a list as well, instead of it refreshing the whole site for each car, absolute torure. I HAVE A MITSUBISHI COLT 1.3 CLEAR TEC CZ2 IN THE C BAND ROAD TAX SO WERE MIT THIS CAR FIT IN MYS A 2009 AND FITS ME WELL AS I AM 6.FT 6 AND FINE IT DIFFICULT TO FIND A CAR I CAN FIT. I HAD IT FOR 3 YEAR NEVER MIST A BEAT ONE OF THE BEAST CAR SPEC I HAVE EVER HAD PLEAS CAN YOU LOOK THIS MODLE OF CAR UP AND SEE IF IT IS GOOD ENUFF TO MAKE IT IN TO YOUR LIST I THING IT BELONG ABOUT NUMBER 20 BUT STILL YOUR IS A GOOD LIST AND VEREY USFULL AS I AM LOOK FOR A NEW CAR SO I CAN TOW A CARAVAN AND STILL PAY ONLY £30 TAX MY CAR IS GOOD BUT CAN ONLY MANAGE 950KG AND THERE ARNT MENY CARAVAN IN THAT WIGHT .MANY THANK. REGARDS WAYNN SCHOFIELD. Volkswagen Golf GTD, Seat Leon 184 FR and BMW 320d better than most of the cars on your list.